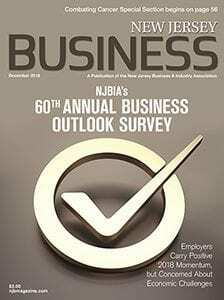 Expectations are high for increased profits, sales and wages in 2019 following a successful 2018 for many New Jersey businesses, according to results found in the New Jersey Business & Industry Association’s 60th Annual Business Outlook Survey. But the survey, released today, also finds a much more guarded outlook for New Jersey’s economy on the whole. In addition to a marginal increase of business owners who will look to offset a $15 minimum wage with raised prices, reduced staff or hours, or an increase in automation, there was a sizable decline from last year in respondents expecting New Jersey’s economy to perform better in the first six months of 2019. Similarly, while 83 percent of members rated the performance of the U.S. economy as excellent or good, only 40 percent rated New Jersey’s economy in the same categories. “It is very encouraging to see New Jersey businesses continuing to experience steady economic growth,” said NJBIA President and CEO Michele Siekerka. “We’re once again seeing a positive outlook on sales, profits and employment, and some of these numbers are truly impressive. Members were also lukewarm when asked if the potential legalization of recreational marijuana would be good for New Jersey’s economy – 42 percent said no, 33 percent said yes and 25 percent were not sure. A total of 77 percent of respondents said they had business-related concerns about the legalization of recreational marijuana. Safety in the workplace was listed as a concern by 56 percent of those respondents, followed by productivity of workforce (48 percent), chronic absenteeism (26 percent) and proximity to dispensaries (10 percent). • 62 percent said sales in 2019 would rise and only 9 percent said sales would fall. The net positive of +53 percent is higher than last year’s sunny forecast of +49 percent. • 55 percent said actual sales were up in 2018, compared to 19 percent who said sales were down. The net positive of +36 percent is considerably higher than last year’s +27 percent net increase and +12 percent net positive in 2016. • 59 percent forecasted that profits will increase in 2019, compared to 13 percent who expect profits to fall. The net positive of +46 percent is higher than last year’s forecast of +43 percent. Actual profits of NJBIA-member businesses in 2018 showed a net positive of +26 percent, compared to a +18 net positive in 2017. • 39 percent said they would increase hiring in 2019, while only 7 percent said they would decrease employment for a net positive of +32 percent. Last year, a net positive of +25 percent forecasted increased employment. Employment in 2018 actually rose by a net positive of +19 percent for members. • 76 percent of members granted a pay raise in 2018. 59 percent gave raises ranging from 1 to 4.9 percent. • 77 percent said they would provide wage increases in 2019. 64 percent will give raises ranging from 1 to 4.9 percent. • 57 percent of respondents described the current conditions in their particular industry as expanding. 22 percent said it was going from recession to recovery. • 54 percent of members in the Housing Construction industry expect their conditions to improve in the first six months of 2019. 53 percent of members in the Transportation industry also expect improvement in the same time frame. • 61 percent made investments to improve productivity in 2018. • 44 percent said the quality of New Jersey’s public schools is better than other states, while 27 percent said the quality of our workforce is better than other states. • 66 percent said increasing the minimum wage to $15 an hour would impact their business. 39 percent projected that impact as “significant.” To offset those impacts, 32 percent said they would raise prices, 26 percent would reduce staff, 24 percent would reduce hours, and 13 percent would increase automation. • 30 percent expect New Jersey’s economy to perform better in the first six months of 2019, while 30 percent expect it to perform worse. The net-zero percentage is down from the +14 net positive outlook for the first six months of 2018. • 50 percent are not planning to expand their business in 2019. Of the 50 percent that are planning to expand, only 14 percent would open another location in New Jersey. • 83 percent said New Jersey has not made progress over the last year in easing regulatory burdens for business. • 88 percent said New Jersey is worse in taxes and fees – a 5 percent increase from 2018. • 77 percent said New Jersey is worse in controlling government spending. • 65 percent said New Jersey is worse in controlling healthcare costs. • 65 percent said New Jersey is worse in attracting new business. • 59 percent said New Jersey is worse in controlling labor costs. • 59 percent said New Jersey is worse in costs of regulatory compliance. Additionally, only 36 percent of members surveyed said they would make New Jersey their domicile in retirement – down from 40 percent in the 2018 Business Outlook Survey. For a full copy of NJBIA’s Business Outlook Survey, visit here. The $15 minimum wage will hurt many business, but it will devastate childcare. This is the one place were you can’t move to automation and you can’t reduce hours or staff. Childcare has strict guideline of teacher per child ratios that must be followed. I pay higher than most other childcare centers in my area, but the increase in pay can only be covered by increasing tuition. Childcare is already expensive due to high taxes, insurance and ect. The increase would effectively make childcare too expensive for anyone to afford (especially in South Jersey) and I will ultimately close my door. I know NJBIA Lobbyist are working hard to stop this minimum wage increase, but has anyone really looked at the impact on childcare?